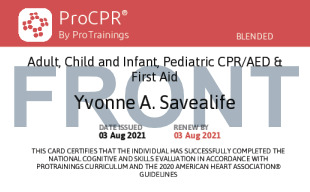 ProFirstAid is an adult, child and infant, pediatric CPR/AED and First Aid 2-year certification. 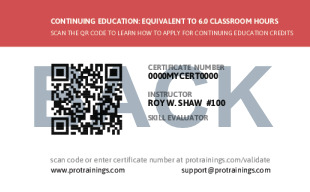 If you are currently certified with Red Cross, AHA, National Safety Council, ASHI or Medic First Aid, you are welcome to utilize the ProFirstAid.com program and receive a new, two-year ProFirstAid certificate. Individuals are free to train, refresh and test at no charge any time 24/7! ProFirstAid's class is nationally accredited and follows the latest American Heart Association, ECC/ILCOR guidelines. Total course time includes 4 hours and 22 minutes of video training as well as knowledge reviews, final test, remedial help and reviewing downloaded material.